Charged particle beam transport code used for Beam Transport computations like e.g. beam envelope fits. This graphic version of a Beam Transport program is maintained as a Graphic Transport Framework. Simple Charged Particle Beam Transport computations are still needed e.g. for designing transfer beam lines for charged particles. This graphic version of charged particle Beam Transport code contains plenty of new and old features exploitable through some graphic tools. This Graphic Framework's Beam Transport code is very efficent with typical turnaround times less than a second for computation and graphic output. This modernized and graphic version of a charged particle beam transport code consists mainly of the old CERN/SLAC/FERMILAB version of Transport coded in portable FORTRAN-77  and C for the OS-dependant system calls. Some enhancements have been added , mainly the possibility to compute space charge effects [3,3a,3b], an alternative stochastic fit algorithm , which allows doing envelope fits with second order or space charge using stochastic fitting. To vary parameters by imposing constraints (fitting to desired values) is the most powerful option in Transport. This improved version of Transport has been embedded in a new graphic shell written in C++ (see Fig.1, 69 kB) (or Tcl/Tk + csh for x86-Linux and Mac OS X - X11 [see Fig.2, 53 kB]) and is providing some pretty and handy GUI type tools (much more elaborated under Windows than under x86-Linux), which makes it a lot easier and swifter to either design new beam lines or debug and investigate existing ones online. A screen shot of a modern GUI Transport Input Editor for Windows is shown in Fig.3 (44 kB). This fruitful and valuable symbiosis of legacy and modern coding shows that you don't have to break with tradition in order to stay up-to-date. The computational part of this version of Transport contains plenty of new and old - but still needed - features and has been well tested over the last 30 years by many expert physicists from PSI and elsewhere around the world. In order to get a list of the currently available most important features of the Graphic Transport Framework (in comparison with the Graphic Turtle Framework), please click here. 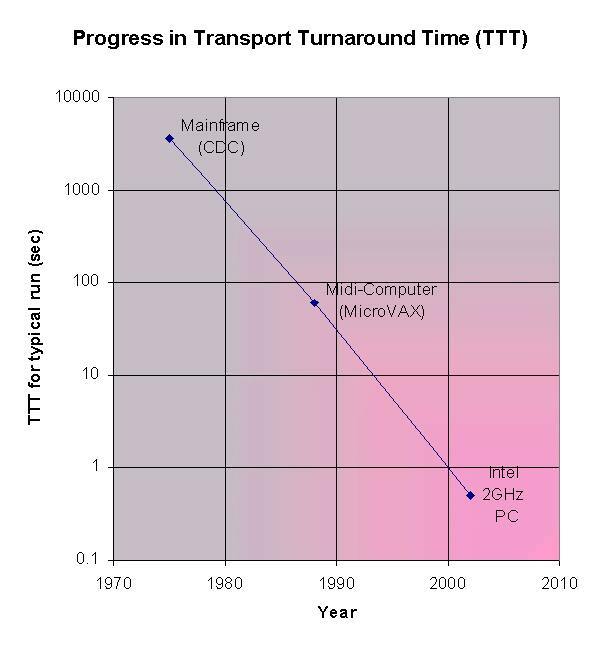 Because of the rapid development in computer technology and the preservation of code-efficiency for this framework, the turnaround time (run Beam Transport-> plot results) has improved by 4 orders of magnitude over the last 27 years. A short résumé about the usefulness of Transport (together with Turtle and MENT) has been published in the PSI Scientific and Technical Report 2000 Volume VI (Large Research Facilities) on pages 24 & 25. A whole collection of Transport input files from different users is available for inspection and/or downloading. To keep the graphic transport framework in good shape some modifications and bug fixes are sometimes necessary. So - from time to time - watch out for modifications and new features. Once a beam line has been designed in first or even in second order it is recommended to switch to the Graphic Turtle Framework in order to look at properties like particle losses, phase space and momentum acceptances or beam profiles. Only a few lines of the Transport input file have to be modified for being used by Turtle. If you prefer to run the Windows versions of Graphic Transport and Turtle Frameworks under x86-Linux, then you may do this today by installing the VMware for some x86-Linux Systems. 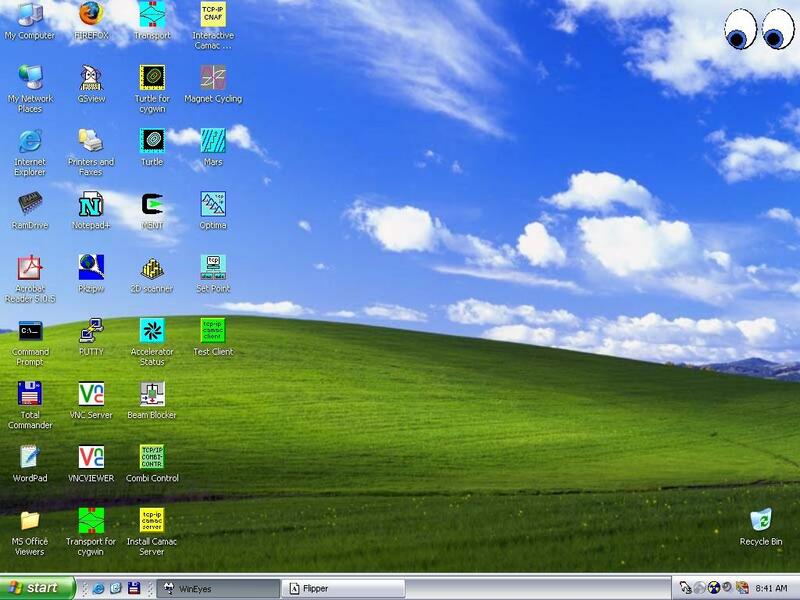 After configuration and licensing of VMware and the installation of one of the 32-bit Windows operating systems inside this virtual machine for x86-Linux, you may then download and install the Windows versions of Graphic Transport and/or Graphic Turtle and run these programs under Windows while x86-Linux is up. If you prefer to run the Windows versions of Transport and Turtle on an Apple Computer, then you may do this today by installing the Virtual PC 6.1 for Mac OS X. After installation and licensing of Virtual PC and the installation of one of the 32-bit Windows operating systems inside this virtual machine for the Mac, you may then download and install the Windows versions of Graphic Transport and/or Graphic Turtle and run these programs under Windows while Mac OS X is up. Because of the growing interest in Proton Cancer Therapy, notes about some principles of optical design for medical gantries are presented here. In order to demonstrate the usefulness of Beam Transport envelope fits, the application of this technique is presented here by using the Isotope Production Yield Optimization at PSI as an example. The usefulness of Graphic Transport for even large acceptance secondary beam lines was demonstrated for the case of the new µE4 muon beam line at PSI. A bootable live CD (see screen shot of the booted system) has been created which contains among many other preinstalled programs 'Transport for Windows' and 'Transport for Cygwin'. (Cygwin is a UNIX/Linux-like OS running on top of Windows.) It may be downloaded as iso-file ( U_R_live_CD.iso, 655 MB, instructions at 1-readme.txt). With low-speed internet connections you may download the split images. of the results achieved with this program. of the beam through a beam line. the angles (valid up to about 100 mr or 5 degrees)}. elements, then aberrations (2nd and higher order terms) remain reasonable small. for checking the validity of the results computed with the beam TRANSPORT code. K.L. Brown, D.C. Carey, Ch. Iselin and F. Rothacker: Transport, a Computer Program for Designing Charged Particle Beam Transport Systems. See yellow reports CERN 73-16 (1973) & CERN 80-04 (1980). F. Sacherer and T.R. Sherwood, Space-Charge Modifications for Transport. MPS-SI/Note - LIN/71-7 (1971). [3a] Frank J. Sacherer, RMS Envelope Equations with Space Charge, IEEE Transactions of Nuclear Science, NS-18, (1971), p.1105-1107. [3b] F.J. Sacherer and T.R. Sherwood, The Effect of Space Charge in Beam Transport Lines, IEEE Transactions of Nuclear Science, NS-18, (1971), p.1066-1067. Udo Witzke, c't Computer Journal (in German), July 1991, p. 182-187.